Disney prides itself on making everyone feel comfortable. Nobody wants a socially awkward situation. But if you’re not careful, it can happen. 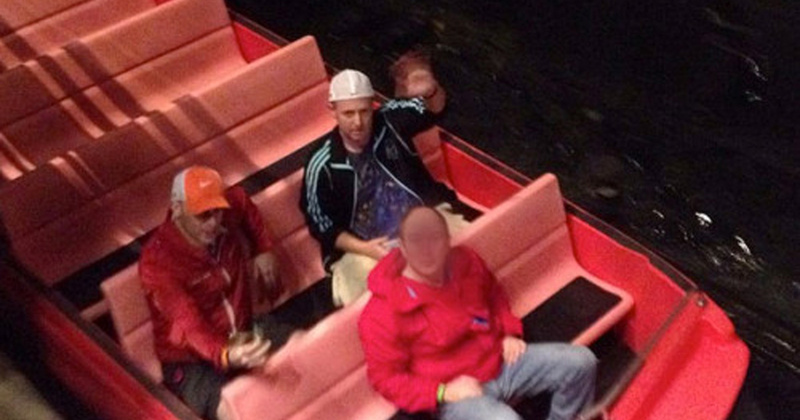 Here are five of the most socially awkward ways in which to ride rides at Walt Disney World. This is not when a ride breaks down. That wouldn’t be socially awkward. That would be socially awesome. But in 1990, during my first visit to the Disney MGM Studios, I had the most painfully awkward Great Movie Ride experience of my life—even worse than that time a couple years ago when I’m pretty sure my “Gangster” thought she was auditioning for the Juliette Lewis part in The Other Sister. The park was brand new, and as you might recall, there were not a ton of rides—unlike today where guests can choose from an expansive smorgasbord of over four rides! The Great Movie Ride was the premier attraction, much like it is today for people who have not seen a Great Movie since 1982. Being the dedicated theme park commandos that we were, my family stayed late. As closing time neared, some in our party wanted to shop for souvenirs on Hollywood Boulevard. And while they did that, my dad and I thought we could squeeze in one last ride. And there was literally no one else in line. Being by yourself on a ride is fun. I have done this many times on Haunted Mansion, Pirates, etc. But I have never forced a Cast Member to give me a personalized version of a 20-minute traveling theater show. Every canned joke. Every tired bit of movie trivia. All with impeccable delivery and expert timing. At least she got a break halfway through when another Cast Member had to take over and pretend to be a gangster for my benefit. By the time we reached Munchkinland, we had caught up to the first car (the “cowboy” car), which was completely empty, except for the third exhausted Cast Member driver who had to deliver his lines to a robot witch. Three Cast Members, all of them forced to remain 20 minutes past quitting time so that I could up my ride count. Our regular guide was gracious—and exceedingly pretty, which you would think would help the awkwardness. But it didn’t. The gangster guy seemed annoyed beyond all belief. He did his lines, but he wasn’t about to interact with us in character. The guy in the other car was practically asleep on his feet and was about thirty yards away. So he was my favorite. Anyway, the rest of our family was annoyed with us when the ride ended because this was before cell phones and we had disappeared for twenty minutes in an empty park. This is the first case of Cast Member cruelty on this list. They take sadistic pleasure in creating socially awkward situations. Cast Members, you know you do. You are denying it while giggling through your teeth. It’s not funny to the rest of us. Barnstormer is a kiddie ride. We know this not because it is 30-seconds long and stars a silly cartoon dog, but because the seats in the dog’s airplane are approximately the width of a flatbread pizza and roughly the same height. As I have experienced many times while riding with my son, my knees must turn sideways in order to allow them to get low enough to fit under the lap bar. My son is five years old and the car is barely big enough to hold us both. The lap bar is useless, but it’s okay because my son is wedged in beside me like a tube sock in a drafty door frame. So when the Cast Member says the official capacity on this thing is 3 adults, they are most assuredly lying. I was with my family again and I don’t remember which combination of three of us got assigned to the same row. But I do know we are all adults and none of us are Keira Knightley. 60 painful seconds later, they needed the Jaws of Life to extricate us from the vehicle. Now you may think that this is my fault and not the Cast Member’s, because what were three adults doing in line for Barnstormer anyway? But I never said we didn’t have a good reason. But WDW46 was a mission. A few socially awkward moments on the rides weren’t going to bother us. Dumbo, Carpets, Triceratops, the aforementioned Barnstormer… Strap us in, take our little plastic counting chip, and start those bad boys up. But the best had to be It’s a Small World. Ted and Shane in a Small World boat by themselves is fine. No big deal. Ted and Shane in a Small World boat with a few other guests is even better. Ted and Shane in a Small World boat with one other random dude who looks like a serial killer is socially awkward. Which of course is exactly what happened. I suspect a little bit of Cast Member cruelty again. It’s after midnight, it’s raining, two crazy guys are minutes away from riding every ride at Disney World in a single day. Hey, let’s stick them in the boat with the lonesome stranger on the off chance that this viral video they’re shooting will help the FBI identify their bodies later! To maximize the awkwardness of the situation, they sat Jeffrey Dahmer in row one, and Shane and Ted in row two. Because that’s what will look creepiest later when the security tapes are played back on Unsolved Mysteries. 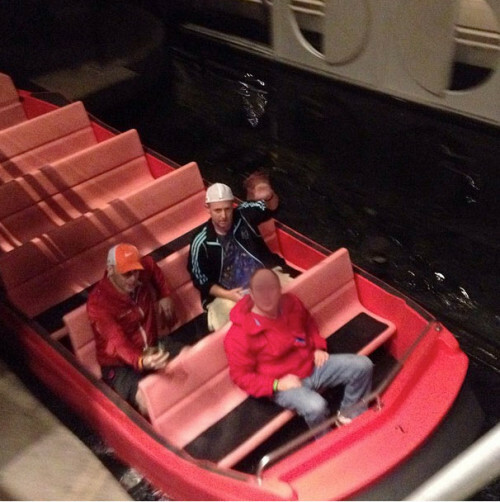 Here for the first time is photographic proof of how socially awkward WDW46 can get. Be A Rebel. Look Stupid. If you go to the parks a lot, you have to work at finding ways to make them new, fresh, different. A lot of times you can do this on the rides that have some “interactivity” to them. You can try to set a speed record on the Tea Cups, or watch Captain EO without the glasses, or listen to the Mandarin version of Spaceship Earth while channeling Walter Cronkite. But if you want to really feel conspicuous, you could try this new angle on Dumbo. I don’t know why I decided to do this. I think that by the time I was in middle school, I had reached the stage of my Parkeology career where the normal Dumbo experience was just not cutting it. To give myself a new experience, I opted to go the whole ride without touching the lever. Basically, that left my Dumbo skimming along through a concrete ditch for several cycles, giving me the same viewpoint as if I had simply crawled around the ride on my hands and knees. The first time around, I was smirking at how clever I was. The second time around, I was starting to notice a few stares. The third time around, I hung my head in shame. I think I made it about halfway through the ride before succumbing to social pressures and making my Dumbo fly. It’s one thing to not touch the gun in Toy Story Mania, which can be done in relative anonymity. It’s another thing to have everyone in line wondering if A) your Dumbo is broken, or B) you are auditioning for the Juliette Lewis part in The Other Sister. 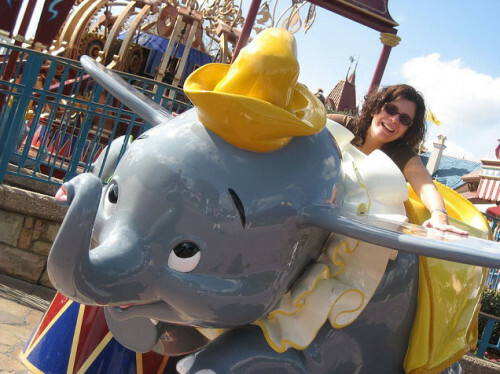 Just like this static Dumbo photo op, only in a circle! Now we come to another bit of Cast Member cruelty. Torturing single riders. Riding solo is socially awkward enough. It’s a kind of Russian Roulette, only there are no empty chambers. You bypass long lines, but as a consequence, you are stuck next to strangers for a rather intimate journey through darkness, danger, and disco yetis. Nine times out of ten, the guy next to you on Rock ‘n Roller Coaster is either the World’s Most Talkative Disney Nerd or a grandpa who is a catapult launch away from losing his Dole Whip, along with his dentures. But the worst—by far the worst—are the teenage girls. There is nothing to make you feel like the world’s perviest creepazoid than when you get stuck with the odd girl out from the traveling cheer squad. Nothing you do can diffuse this socially awkward situation. Nothing you can say that won’t sound skeezy. You can’t ask if she’s enjoying her day. You can’t ask if this is her first time. You can’t jokingly ask if it’s okay if you scream. All you can do is plant yourself in the farthest corner possible and twist your head around so that you are not in any way looking at her. Keep your head that way the entire ride, no matter what it does to your neck. Then do your level best to keep your Dole Whip and your dentures from coming out. The only exception to this rule is if she starts talking to you first. Then fake a panic attack and bolt from the ride. And Shane would personally love it if you checked out his thrilling pirate adventure novel Johnny Shipwreck. Available on Amazon! This entry was posted in Theme Park Life and tagged Barnstormer, Dumbo, Great Movie Ride, it's a small world. Bookmark the permalink. Oh god, I’ve done several solo Disney trips and I have learned how to not be that awkward rider. 1. Always polity ask for the last row in a any boat ride. 2. Being a lady doesn’t hurt to avoid the rock’n’rollercoaster – teenager predicament. 3. If you feel awkward, avoid eye contact at all costs and run like you are about to miss the last bus heading to your resort when you disembark. Somehow I might feel even more creepy as a solo dude asking for a special back row! But I can definitely see how being a lady softens things. Ladies generally aren’t as creepy as guys. Good reading!!! Thanks for the great article as usual. I haven’t had the misfortune to be on the receiving end of an awkward moment. But, it is fun to make someone else’s day more interesting when you know where those cameras are and when they snap that priceless on-ride photo! Literally, at the end of the day, you can get pretty loopy after riding Tower of Terror 5 or 6 times in a row with no wait while everyone else is at Fantasmic! Glad to know that you are making life more awkward for everyone else, Ryan! God, the rides with rows when you’re alone… Some family sits down, spread out and comfortable, ready to ride and you have to be like, “Uh, can you guys scoot down?” Then they all have to cram in and try not to touch the weirdo. If they would just put the single person in a row first, then the family would have a few minutes to accept the fact that they are going to be crammed in with the weirdo. And it would save me the inevitable stumbling out of the vehicle because I forget that I am terribly awkward and attempt to exit too quickly. I’ve been pretty lucky with Single Rider, although last time I did it for Rock n Roller Coaster I was next to a little kid with an big umbrella who just threw it loose at our feet. I decided we would probably not die and it would stay where it was, but boy does the thrill level of that ride really increase when you know there’s a slight chance you may be impaled at any moment. Death by impaling is definitely a thrill. It is sad that I would rather have the risk of impalement than be stuck next to weirdos in the same Pirates boat. Help! I am in need of extreme parkeology services! I have been to animal kingdom quite a few times since reading y’all’s blog and every time since I have looked for the hidden path that you all wrote about a long time ago! I always look and probably look quite silly looking for it, but have yet to find it! I am about to make the long dangerous trip back to Disney and would like the advice of the parkeologist them selves that made the discovery about whether or not the trail is still there and if so advice about how I could find it myself! 1) Go to the main walkway between Africa and Asia. 2) Detour onto the secondary (spur) walkway, which is paved, but often not taken by guests. This one is sometimes used for character greeting areas and/or smoking areas, and comes out right near the restrooms on the main path near Asia. 3) Find the part of that path that is a bridge over a small creek. Look up-river towards the higher part of the creek (you will be facing away from the Tree of Life). You should be able to spot the stepping stones across the creek that were part of the original secret path. Like I said, you can’t really get to them without scrambling through underbrush, but that’s the path right there. As Shane said its still there and as far as I’m concerned still available to guests. As I mentioned in the original post; you will feel like you are someplace you are not supposed to be. Ignore that feeling and keep pushing ahead. I love all parkeology articles, but this one is just my favorite. Laughed until I had tears in my eyes. Great work! Thanks for the kind words, Mike! Makes all this awkwardness worthwhile! Excellent article sir! Educational and entertaining. I salute you. So this one time my family of 8 was riding is a small world. My bff, mom, dad and I were placed in the last row. Nothing about my bff and I are small. That row is smaller then the rest. We need a shoe horn to sit down and as soon as we left the loading platform the front of the boat lifted out of the water. My bff held on tight to me and exclaimed the whole ride “I’ll never let go jack” funnest time ever on that ride. When we got back to our hotel that night, there were other guests talking about it. Jones, that might be literally the most awkward scenario possible at Disney. I cringe with you, my friend! The single riders line at the ski lift at Blizzard Beach can be even more awkward, since you are even closer to your fellow passengers. And in swimsuits. Just the worst. I love your tongue-in-cheek writing style. Great article. I especially loved the “for those who haven’t seen a great movie since 1982” line. Keep up the good work. Looking forward to reading more. Thanks for checking us out, Chris! We tend to do the absurd stuff around here. Check out our archives when you get a chance. Man, I hope that poor guy on small world doesn’t read your blog.. first he’s a middle aged dude riding small world completely alone, no family, no date, nobody.. then he gets described as a serial killer. True embarrassing story: several years ago we went to AK with my then seven year old dd, who refused to ride any roller coasters. The husband and son went on everest together while I stayed with my dd.. then I jumped in the single rider line alone. I wound up sitting next to this guy.. perfectly normal guy. Kind of awkward though since obviously we were total strangers. I turned to him as we were going up the first hill and said “Guess I should warn you, I’m a screamer. Sorry.” Didn’t even hit me what I had said until after the ride. I was mortified. It’s true though, put me on a coaster and it’s just one solid scream from the first hill to the end. I blurred his face because I realize it’s not fair to the poor guy. But if he does somehow find himself on this blog and recognize his jacket, I hope he realizes it is all in fun. In fact, I have been in the reverse situation as a single rider, so I know just how awkward it is!